Background: Various techniques of central neuraxial blockade have been tried and successfully used for caesarean section surgeries. Nowadays it is must and essential to know the possible effective dose of clonidine to overcome its known side effect like bradycardia, hypotension and sedation for better outcome of mother as well as foetus in lower segment caesarean section. We have conducted such study to compare different doses of clonidine as an adjuvant to intrathecal isobaric levobupivacaine. The plain levobupivacaine has been shown to truly isobaric with respect to CSF of pregnant women and this property got advantage over hyperbaric bupivacaine in its predictable spread. Materials and Methods: There were about 90 cases of emergency caesarean section of more than 37 weeks gestation with ASA physical status class 2 under spinal anaesthesia were randomly divided into three groups of 30 patients each. In all groups we assessed onset, two segment regression and requirement of analgesic in post-operative period, level of motor block by modified bromage scale [Table 1] and sedation by Campbell sedation score [Table 2]. Maternal and foetal hemodynamic was monitored as well. Group A (n = 30) 10 mg of 0.5% (2 ml) isobaric levobupivacaine + 15 mcg clonidine (0.5 ml). Group B (n = 30) 10 mg of 0.5% (2 ml) isobaric levobupivacaine + 30 mcg clonidine (0.5 ml). Group C (n = 30) 10 mg of 0.5% (2 ml) isobaric levobupivacaine + 45 mcg clonidine (0.5 ml). Normal saline was used to make volume of clonidine upto 0.5 ml. Result: Onset of sensory block was highest in group A with significant difference (P value <0.0001) in all three groups. Two segment regression time (in minutes) was highest in group C with significant difference (P value <0.0001) in all three groups. There was fall in systolic blood pressure (SBP) <80% of baseline was found in 0 (0.00%), 10 (33.33%) and 22 (73.33%) patients in group A, B and C respectively while fall in HR <80% of baseline was found in 0 (0.00%), 1 (3.33%) and 19 (63.33%) patients. Sedation score was 1 in 30 (100%) patients in group A, it was 1 in 10 (33.33%), 2 in 20 (66.67%) in group B while it was 1 in 5 (16.77%), 2 in 10 (33.33%) and 3 in 15 (50%) patients in group C. Conclusion: Spinal anaesthesia performed with isobaric 0.5% levobupivacaine with 30 mcg clonidine (Group B) provides better haemodynamic stability, early onset of sensory and motor blockade, decreased requirement of post-operative analgesia. Spinal anaesthesia is one of the most favoured choice for caesarean section. Advantages being simple technique,, rapid onset of action and reliability in producing uniform sensory and motor blockade.,, Bupivacaine being one of the commonly used local anaesthetic for caesarean section. In Levobupivacaine, levo-enantiomer of bupivacaine has recently been introduced for routine obstetric and non-obstetric spinal and epidural anaesthesia, peripheral nerve blocks, and infiltration analgesia. Intrathecal levobupivacaine had a similar clinical profile to that of racemic bupivacaine but causes less motor blockade at similar doses. The plain levobupivacaine has been shown to be truly isobaric with respect to CSF of pregnant women as specific gravity of both is nearly same and this property got advantage over hyperbaric bupivacaine in its predictable spread. Based on various studies, it is recommended that levobupivacaine 12.5–13.5 mg should be used for successful spinal anaesthesia for caesarean section. Adjuvants added to intrathecal local anaesthetic prolongs the duration of sensory and motor blockade and decreases the local anaesthetic requirement. Alpha2 -Adrenergic agonists also enhance analgesia as an adjuvant to local anaesthetic in spinal blocks., Clinical studies have suggested that intrathecal clonidine prolongs sensory as well as motor block of spinal anaesthesia. It decreases local anaesthetic requirements and also provides prolonged postoperative analgesia.,,,, We planned doses of clonidine 15, 30 and 45 mcg as adjuvent because no study has been done on these doses. Power analysis based on the pilot cases done prior to the study had indicated that at least 29 patients in each group will be required to demonstrate a clinically significant difference (50% increase) in the duration of postoperative analgesia with an a = 0.05 and a power of 90%. In our study we included ninety cases of caesarean section of more than 37 weeks gestation with ASA physical status class 2 under spinal anaesthesia. Patients with any serious comorbid conditions, contraindication to spinal anaesthesia and refusal to regional anaesthesia were excluded from our study. Patients were randomly divided into three groups (group A, group B and group C) of 30 patients each. In group A, group B and group C, we used 10 mg 0.5% isobaric levobupivacaine (2 ml) +15 mcg clonidine (0.5 ml), 10 mg 0.5% isobaric levobupivacaine (2 ml) +30 mcg clonidine. (0.5 ml) and 10 mg 0.5% isobaric levobupivacaine (2 ml) +45 mcg clonidine (0.5 ml) respectively. Normal saline was used to make volume of clonidine up to 0.5 ml. After getting written and informed consent, patient were randomized in one of the study groups using computer generated random number table. Patients were not aware in which group they have kept. In the operation theatre, 18 gauze intravenous line was secured and 500 ml of ringer lactate was given after application of standard monitoring. Inj ranitidine 50 mg iv and inj metoclopramide 10 mg iv was given as premedication. Drug for spinal anaesthesia was made by an anaesthetic dedicated for that and Spinal anaesthesia was given in lateral position using standard technique by different senior anaesthesiologist using 25 G Quincke needle at L3- L4 interspace after observing the free flow of cerebrospinal fluid. 2.5 ml of drug combination was injected. After injecting drug, patient was laid in supine position. Caesarean section was done by senior obstetrician by Pfannenstiel incision. Inj oxytocin 15 IU IM was given after delivery of foetus. Bradycardia was treated with inj atropine 0.5 mg and hypotension was treated with inj mephenteramine 6 mg boluses. Apgar score of baby and time of requirement of first rescue analgesia was noted. In all groups we assessed onset of analgesia and motor block, two segment regression, level of motor block by modified bromage scale [Table 1], requirement of analgesic in post-operative period and sedation by Campbell sedation score [Table 2] as primary outcome. Maternal hemodynamic and foetal Apgar score was recorded as secondary outcome measure. The main aim of study was to establish safe and effective dose of intrathecal clonidine as adjuvant to levobupivacaine in caesarean section surgeries. This is a prospective double blind randomised study, conducted in the department of anaesthesia in collaboration with department of obstetrics and gynaecology after approval of institutional ethical committee. Duration of study was one year. The continuous data were summarized as Mean ± SD while discrete (categorical) in %. The primary outcome measures of three groups over the periods were compared by repeated measures two factor (periods and groups) analysis of variance (ANOVA). The significance of mean difference between the groups was done by Bonferroni multiple contrast test after ascertaining the homogeneity of variance by Levene's test. Groups were also compared by one way ANOVA followed by Tukey's post hoc test. Discrete (categorical) variables were compared by Chi-square (χ2) test. Total 90 women of age 21-45 years (mean 27.80 ± 3.16) with same characteristics were included. The mean age (years) in group A, B and C was 27.01 ± 3.16 and 26.50 ± 3.37 and 26.73 ± 3.04 years respectively there was no significant difference between age of different subgroups. The mean weight (kilograms) in group A, B and C was 81.70 ± 7.53, 84.30 ± 5.43 and 84.57 ± 4.78 respectively, no significant difference was in any groups. Mean pulse rate/minute was 89.13 ± 12.15, 96.50 ± 13.80 and 90.07 ± 11.86 systolic blood pressure in mm of Hg was 125.67 ± 7.32, 129.40 ± 9.97 and 127.57 ± 8.44 diastolic blood pressure in mm of Hg77.77 ± 8.81, 81.33 ± 10.55 and 80.93 ± 9.71 mean arterial pressure in mm of Hg 93.74 ± 6.98, 97.35 ± 8.06 and 96.49 ± 7.94 in group A B and C respectively. Maternal hemodynamic parameters were comparable in all three groups and no significant difference was found [Table 3]. Hypotension and Bradycardia was monitored and it was found that Fall in systolic blood pressure (SBP) <80% of baseline was found in 0 (0.00%), 10 (33.33%) and 22 (73.33%) patients in group A, B and C respectively while Fall in HR <80% of baseline was found in 0 (0.00%), 1 (3.33%) and 19 (63.33%) patients [Table 3]. Time (seconds) to start of sensory block was highest in group A with significant difference (P-value <0.0001) in all three groups. It was 208.23 ± 12.89, 164.43 ± 3.02 and 154.30 ± 02.93 in group A, B and C respectively. Two segment regression time (in minutes) was highest in group C with significant difference (P value <0.0001) in all three groups. It was 72.29 ± 2.44, 83.07 ± 4.62 and 92.50 ± 1.68 in group A, B and C respectively. Duration in minutes at which first analgesia was required was highest in group C with significant difference in three groups (P value <0.0001). It was 192.37 ± 7.54, 224.93 ± 2.41 and 235.37 ± 1.77 in group A, B and C respectively. 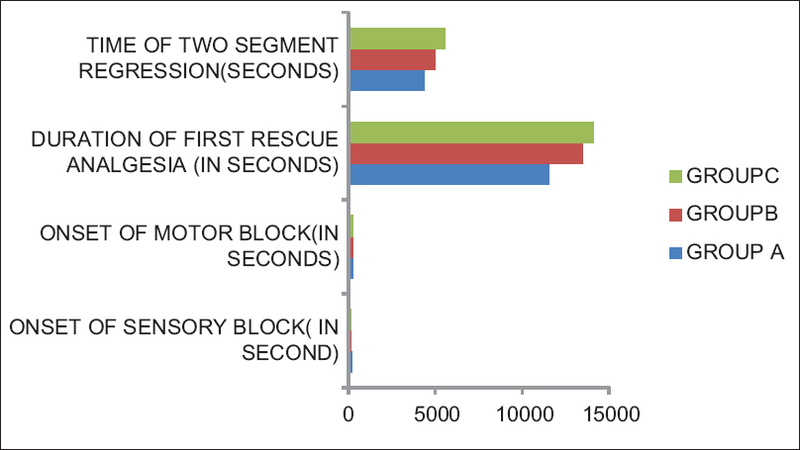 Time (seconds) to start of motor block was and highest in group A with significant difference was found in all three groups (P value <0.0001) and it was 273.60 ± 25.72, 253.67 ± 2.92 and 232.93 ± 4.91 in group A, B and C respectively [Table 4] and [Figure 1]. Sedation score was 1 in 30 (100%) patients in group A, it was 1 in 10 (33.33%), 2 in 20 (66.67%) in group B while it was 1 in 5 (16.77%), 2 in 10 (33.33%) and 3 in 15 (50%) patients in group C [Table 4]. Since the last decade, spinal anaesthesia has been refined with the addition of adjuvants to local anaesthetic agents. It was already reported that solely use of local anaesthetic in caesarean section undergoing spinal anaesthesia does not provide sufficient anaesthesia during uterine manipulation and uterine closure. Clonidine is a selective partial agonist for α-2 adrenoreceptor and used as adjuvant to local anesthetic to prolong the duration of spinal anesthesia. In our study it is seen that when levobupivacaine is used with different doses of clonidine, onset of sensory blockade as well as motor blockade is decreased with increasing dose of clonidine. The duration of sensory as well as motor blockade prolongs with increasing doses of clonidine. This is also noted that analgesic requirement in post-operative period is early in patient where lesser dose of clonidine were used. Similar results were seen in study by Shah BB et al. but bupivacaine was used in that study. Sedation score was towards higher site as dose of clonidine increases. The maximum patients in group C were having sedation score three while in group A it was one in all patients. Study done by Shamad et al. also suggested that increasing dose of clonidine causes more sedation but significant difference was not found and it was done on supraclavicular brachial plexus block as well. In our study complications like fall of systolic blood pressure below 80% of base line and fall of heart rate below 80% of base line was more common in group C in which highest dose of clonidine as adjuvant were used. Our findings were also consistent with Shah BB et al. In a study done by Takhur et al., it was seen that 30 mcg clonidine was associated with more incidence of hypotension than 15 μg of clonidine. 15 mcg clonidine added to 11 mg hyperbaric bupivacaine provides better sensory and motor blockade for inguinal herniorrhaphy. As this study was done in patients of inguinal herniorraphy with hyperbaric bupivacaine, the results were not much comparable but it was seen that with increasing dose of clonidine, incidence of hypotension increases. It is clear from our study that levobupivacaine when used in combination with different doses of clonidine, early desirable sensory and motor block was found with 45 mcg of clonidine but on considering hemodynamic changes and side effect, these were significantly higher than other groups. With 30 mcg of clonidine, desirable sensory and motor block was found in adequate time and side effects were also less. It is also seen that with 45 mcg of clonidine, sedation score was high and it is advisable to use this dose when sedation is required in such patient after weighing risk benefit ratio. From this study, we concluded that spinal anaesthesia performed with isobaric 0.5% levobupivacaine with 30 mcg clonidine (Group B) provides better haemodynamic stability, early onset of sensory and motor blockade, decreased requirement of post-operative analgesia, comfortable sedation with less maternal and neonatal side effects in comparison to 15 and 45 mcg clonidine. Thus this combination provides effective and safe alternative in caesarean section. Hunt C. Spinal anesthesia for obstetrics. Int Anaesthesiol Clin 1989;27:26-30. Lucy S, Naugler M. Spinal anesthesia for caesarean section. Can J Anaesth 1991;38:940-1. Morgan P. Spinal anesthesia in obstetrics. Can J Anaesth 1995;42:1145-63. Covino B. Rationale for spinal anesthesia. Int Anaesthesiol Clin 1989;27:8-12. Carter J, Macarthur A. Spinal anesthesia for Caesarean section. Contemp Anesth 1994;4:11-5. Hunt C, Dutta S, Hauch M. Perioperative analgesia with subarachnoid fentanyl-bupivacaine. Anaesthesiology 1987;1:67. Monasky M, Zinsmeister A, Stevens C, Yaksh T. Interaction of intrathecal morphine and ST-91 on antinociception in the rat: Dose-response analysis, antagonism and clearance. J Pharmacol Exp Ther 1990;254:383-92. Ossipov M, Harris S, Lloyd P, Messineo E, Lin B, Bagley J. Antinociceptive interaction between opioids and medetomidine: Systemic additivity and spinal synergy. Anesthesiology 1990;73:1227-35. Bonnet F, Buisson V, Francois Y, Catoire P, Saada M. Effects of oral and subarachnoid clonidine on spinal anesthesia with bupivacaine. Reg Anesth 1990;15:211-4. Van Tuijl I, van Klei W, van der Werff D, Kalkman C. The effect of addition of intrathecal clonidine to hyperbaric bupivacaine on postoperative pain and morphine requirements after Caesarean section: A randomized controlled trial. Br J Anaesth 2006;97:365-70. Sethi BS, Samuel M, Sreevastava D. Efficacy of analgesic effects of low dose intrathecal clonidine as adjuvant to bupivacaine. Indian J Anaesth 2007;51:415-9. Shah B, Shidhaye R, Divekar D, Panditrao M, Panditrao M, Suryawanshi C. Effect of addition of Clonidine to Bupivacaine used for patients undergoing spinal anesthesia: A randomized, double blind, controlled study. Sri Lankan J Anaesthesiol 2011;19:17-21. Bajwa S, Bajwa S, Kaur J, Singh A, Singh A, Parmar S. Prevention of hypotension and prolongation of postoperative analgesia in emergency cesarean sections: A randomized study with intrathecal clonidine. Int J Crit Illn Inj Sci 2012;2:63-9. Hamber E, Viscomi C. Intrathecal lipophilic opioids as adjuncts to surgical spinal anesthesia. Reg Anesth Pain Med 1999;24:255-63. Kothari N, Bogra J, Chaudhary AK. Evaluation of analgesic effects of intrathecal clonidine along with bupivacaine in cesarean section. Saudi J Anaesth 2011;5:31-5. Shamshad B, Madhusudanan ES, Jacob AM. Comparison of two doses of clonidine as an adjuvant to levobupivacaine for supraclavicular brachial plexus block. World J Pharm Med Res 2017;3:454-7. Thakur A, Bhardwaj M, Kaur K, Dureja J, Hooda S, Taxak S. Intrathecal clonidine as an adjuvant to hyperbaric bupivacaine in patients undergoing inguinal herniorrhaphy: A randomized double-blinded study. J Anaesthesiol Clin Pharmacol 2013;29:66-70.